"Radharani is hari-priya, 'very dear to Krishna.' Through the mercy of Radharani we can easily approach Krishna. If Radharani recommends, 'This devotee is very nice,' then Krishna immediately accepts me, however great a fool I may be. 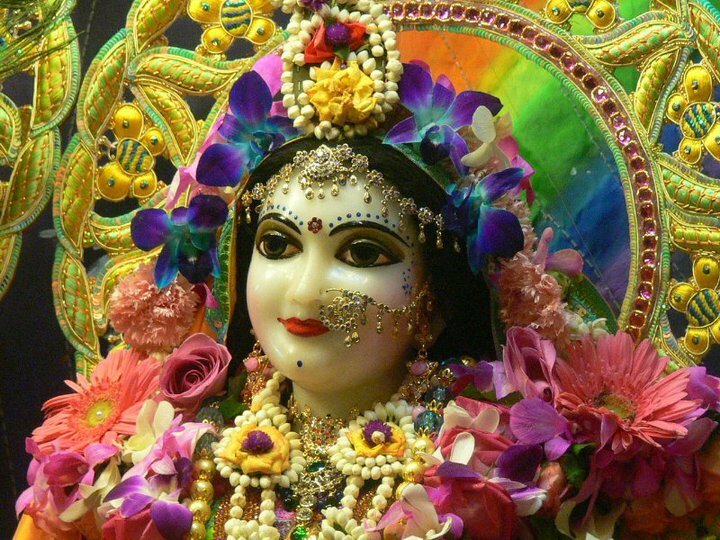 Because I am recommended by Radharani, Krishna accepts me. Therefore in Vrndavana you'll find all the devotees chanting Radharani's name more than Krishna's. Wherever you'll go, you'll find the devotees greeting one another, 'Jaya Radhe!' You'll find this still in Vrndavana. The devotees are glorifying Radharani. If you go by the speculative process to understand Krishna, it will take many, many lives. But if you take to devotional service and just try to please Radharani, Krishna will be gotten very easily."